I had just received the notification for an upgrade available for Google Maps for Mobile application on my Series 60 device. This new incremental upgrade brings a couple of new features to one of my favorite mobile applications. Apart from the slightly updated UI, you can now sync your favorite locations and starred items from your phone to your Google Account, which means they are accessible from anywhere on the PC or other mobile devices. Your saved landmarks from other applications such as Ovi Maps are also synced with your account, but Iâ€™m not sure you can use starred items to plan a navigation route in Ovi Maps. 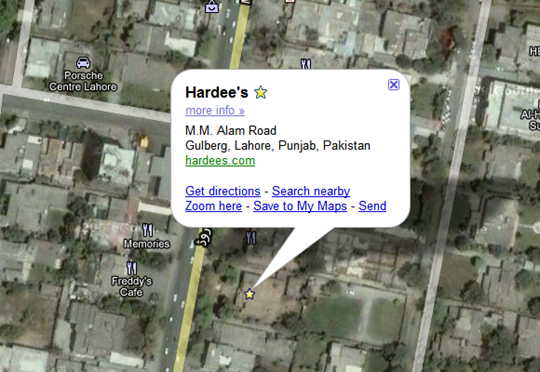 Interestingly, the satellite imagery is still outdated for most places so Hardees still shows as an empty lot in the above shot even though I had dinner their about 3 days ago. The update is only for Windows Mobile and Symbian devices but Google Mobile team says that they are working to get these updates rolled out on other mobile platforms as well. 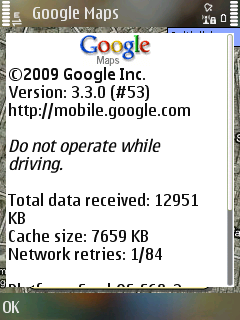 I just hope they decide to update all mobile versions with navigation features like in Android. Pagination Problem still not solved.Can i help you? Ran 28 queries in 0.160 seconds.